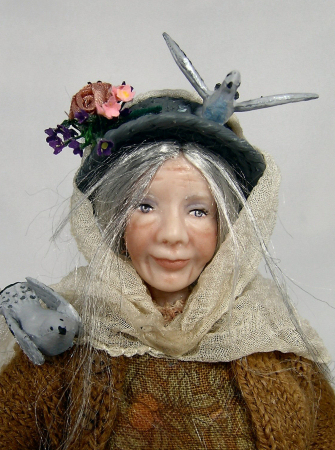 This is a great character, Mazie lends herself to almost anything, she has been a Peddlar, a Flower seller and more recently a Posh lady who prefers her cucumber sandwiches without crusts. She is so versatile, I love painting her and the best part for me, is wigging. The last thing is dressing her, she is a perfect mold for anyone to have in stock. Thank you Cynthia. Love her.